A little bunny, named Mimi, was unfortunately born with no ears, and as a result, was deaf. If poor little Mimi hadn’t suffered enough, she was also born with only three legs, so wasn’t able to hop around like the other bunnies. 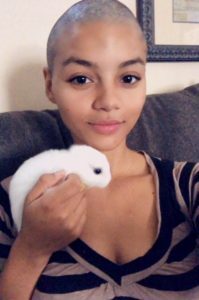 However, the little rabbit was in luck, as 22-year-old Rodajia Welch came along, and saw how sweet the fluff ball was and decided to adopt her. Not only did Rodajia adopt Mimi, but she also took on all the little bunny brothers and sisters, as their owner became very sick, and was therefore unable to care for them. Now, the name Mimi didn’t come out of nowhere, as Rodajia wanted a name fit for her little bunny’s character. She began researching for hours, until her boyfriend, Josh, came across the perfect name. Josh, found a specific type of cosplay where the characters have animal ears, which was known as Kemonomimi and with that, the name Mimi was created, which seemed like the perfect choice. 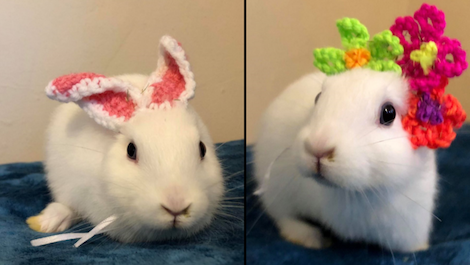 As the bunny family grow older, Rodajia has made the decision to give them away to good, loving homes – but Mimi will always be hers. She said that she has a close connection with the ball of fur, and wouldn’t want to give away her little ear model. We think Mimi has the best owner in the world, and that her ears look extremely fashionable. We’ll be expecting to see Mimi modelling them at the next New York Fashion Week for sure! 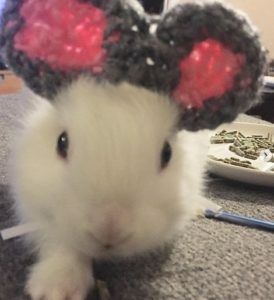 Do you think Mimi rocks the knitted ears well? What do you think Rodajia should knit for Mimi next? Let us know in the comments, or on Twitter at @WhatsTrending.